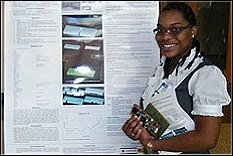 As first place winner of the URRS award, Prince will be presenting her research at the National Society of Black Engineers (NSBE) national convention in March. Of the six national regions, Prince is the winner for Region 2, which is comprised of over 2,400 collegiate student members. These members represent chapters throughout Pennsylvania, Delaware, Maryland, Washington, D.C., West Virginia, Virginia, North Carolina, and South Carolina. On winning the award, Prince is ecstatic, recalling, “I was in complete shock when I was announced as the first place winner. I am very grateful to receive such a high honor bestowed by my peers.” Sponsored by NSBE, this first place tribute consists of a trophy and a $200 monetary award. Currently, Prince is the PCI Co-Chair for the National Society of Black Engineers and is involved with many volunteer activities including Operation Caring Spirits--an Air Force volunteer program, Christmas in April, and Walk for Education. She has won other awards including several academic awards and the Michael L. Cherry Scholarship award, “for community service and being an inspiration to others.” As a mechanical engineering senior, she is looking forward to her upcoming graduation in Fall 2009. Post graduation, she plans to pursue a career with General Electric Transportation in their Edison Engineering Development Program, after which she plans to enroll in graduate school. For more information on the University of Maryland’s chapter of NSBE, please visit http://www.bes.umd.edu. "I am very grateful to receive such a high honor."